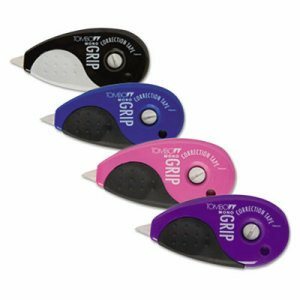 MONO� Grip Top-Action Correction Tape features a pivoting tape head that delivers ultra-smooth tape application. Top-action applicator with soft rubber grip offers comfortable left-hand or right-hand use. Dual Gear technology features a self-tightening mechanism which prevents tape looping and pulling. Make instant corrections with no drying time � no mess and no waiting! Easily adjust break-proof tape with the rewind knob. Unique design allows you to comfortably make corrections throughout the work day. Premium-quality tape allows you to re-write with pen, pencil or marker. Non-refillable. Stock up and save! Correction Tape Type: Non-refillable; Line Coverage: 1; Tape Width: 1/5"; Tape Length: 394".